Steve Huffman, co-founder of social news site Reddit, gave an excellent presentation (slides, transcript) on the lessons he learned while building and growing Reddit to 7.5 million users per month, 270 million page views per month, and 20+ database servers. Steve says a lot of the lessons were really obvious, so you may not find a lot of completely new ideas in the presentation. But Steve has an earnestness and genuineness about him that is so obviously grounded in experience that you can't help but think deeply about what you could be doing different. And if Steve didn't know about these lessons, I'm betting others don't either. There are seven lessons, each has their own summary section: Lesson one: Crash Often; Lesson 2: Separation of Services; Lesson 3: Open Schema; Lesson 4: Keep it Stateless; Lesson 5: Memcache; Lesson 6: Store Redundant Data; Lesson 7: Work Offline. By far the most surprising feature of their architecture is in Lesson Six, whose essential idea is: The key to speed is to precompute everything and cache It. They turn the precompute knob up to 11. It sounds like nearly everything you see on Reddit has been precomputed and cached, regardless of the number of versions they need to create. For example, they precompute all 15 different sort orders (hot, new, top, old, this week. etc) for listings when someone submits a link. Normally developers would be afraid of going this extreme, being this wasteful. But they thought it's better to wasteful upfront than slow. Wasting disk and memory is better than keeping users waiting. So if you've been holding back, go to 11, you have a good precedent. The essence of this lesson is: automatically restart failed and cancerous services. The downside of running your own system in a colo is that you are on the hook for maintenance. When your service dies you have to fix it now, even at 2AM. This is a constant tension in your life. You have to take a computer with you everywhere and you know that anytime anyone calls it could be another disaster you have to fix. It ruins your life. One way to mitigate this problem is restart process that have died or become cancerous. Reddit uses Supervise to automatically restart applications. Special monitoring programs kill processes that use too much memory, use too much CPU, or aren’t responsive. Instead of worrying just restart and the system is up. Of course you have to read the logs and find a root cause, but until then it keeps you sane. The essence of this lesson is: group like processes and data on different boxes. Doing too much work on one box causes a lot of context switching between jobs. Try to make each database server serve the same kind of database in the same way. This means all your indices will be cached and they won’t be paged in and out. Keep everything as similar as possible together. Don’t use Python threads. They are slow. They put everything in separate multiple processes. 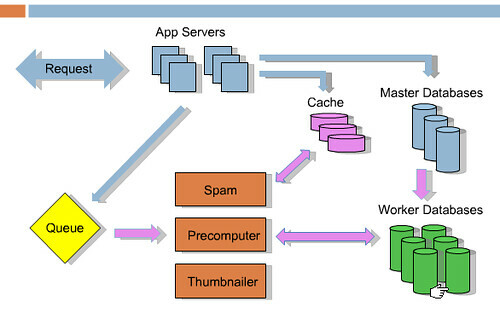 Services like spam, and thumbnails, query caching. It allows you to put them on different machines easily. You already solved problems of communicating between process. Once solved it keeps the architecture clean and it's easier to grow. The essence of this lesson is: don't worry about the schema. They used to spend a lot of time worrying about the database, keeping everthing nice and normalized. You shouldn’t have to worry about the database. Schema updates are very slow when you get bigger. Adding a column to 10 million rows takes locks and doesn’t work. They used replication for backup and for scaling. Schema updates and maintaining replication is a pain. They would have to restart replication and could go a day without backups. Deployments are a pain because you have to orchestrate how new software and new database upgrades happen together. Instead, they keep a Thing Table and a Data Table. Everything in Reddit is a Thing: users, links, comments, subreddits, awards, etc. Things keep common attribute like up/down votes, a type, and creation date. The Data table has three columns: thing id, key, value. There’s a row for every attribute. There’s a row for title, url, author, spam votes, etc. When they add new features they didn’t have to worry about the database anymore. They didn’t have to add new tables for new things or worry about upgrades. Easier for development, deployment, maintenance. The price is you can’t use cool relational features. There are no joins in the database and you must manually enforce consistency. No joins means it’s really easy to distribute data to different machines. You don’t have to worry about foreign keys are doing joins or how to split the data up. Worked out really well. Worries of using a relational database are a thing of the past. Goal is for every app server to handle every type of request. As they grew they had more machines so they couldn’t rely on an in app server caches. They originally replicated state to each app server which was a waste of memory. They couldn’t use memcached because they kept such a large amount of fine grained it was too slow. They rewrote to use memcache and don’t store any state in app servers. Makes it easy if app servers fail. And to scale you can just add more app servers. The essence of this lesson is: memcache everything. They store everything in memcache: 1. Database data 2. Session data 3. Rendered pages 4. Memoizing (remember previously calculated results) internal functions 5. Rate-limiting user actions, crawlers 6. Storing pre-computing listings/pages 7. Global locking. They store more data now in Memcachedb than Postgres. It’s like memcache but stores to disk. Very fast. All queries are generated by same piece of control and is cached in memcached. Change password Links and associated state are cached for 20 minutes or so. Same for Captchas. Used for links they don’t want to store forever. They built memoization into their framework. Results that are calculated are also cached: normalized pages, listings, everything. Rate-limit everything using memcache + expiration dates. A good way to protect your system from attacks. Without a rate limiting subsystem a single malicious user could take down the system. Not good. So for users and crawlers they keep a lot of it in memcache. If the user comes again within a second they get bounced. Regular users don’t click that fast so they want notice. The Google crawler will hit you has fast as you let it, so when gets slow just crank up the rate limiter and it quiets the system down without hurting users. Everything on Reddit is a listing: the front page, in box, comment pages. All are precomputed and dumped into the cache. When you get a listing it’s taken from the cache. Every link and every comment is probably stored in a 100 different versions. For example, a link with 2 votes that’s 30 seconds old is rendered and cached separately. When it hits 30 seconds it’s rendered again. And so on. Every little piece of HTML comes from cache so the CPU isn't wasted on rendering. When things get slow just add more cache. When messing with their fragile inconsistent database they use memcache as a global lock. Works for them even thought it’s not the best way. The essence of this lesson is: the key to speed is to precompute everything and cache it. The way to make a slow website is have a perfectly normalized database, collect it all on demand, and then render it. It takes forever on every single request. So if you have data that might be displayed in several different formats, like links on front page, in-box, or profile, store all those representations separately. So when somebody comes and gets the data it’s already there. Every listing has 15 different sort orders (hot, new, top, old, this week). When someone submits a link they recalculate all the possible listing that link could effect. It may be a little wasteful upfront, but it’s it better to wasteful upfront than slow. Wasting disk and memory is better than keeping users waiting. The essence of this lesson is: do the minimal amount of work on the backend and tell the user you are done. If you need to do something do it while the user isn’t waiting for you. Put it in a queue. When a user votes on Reddit that updates listings, a user’s Karma, and lots of other stuff. So on a vote the database is updated to know that the vote happened, then a job is put in the queue, the job knows the 20 things that need to be updated. When the user comes back everything has been precached for them. Work they do offline: 1. Precompute listings 2. Fetch thumbnails 3. Detect cheating. 4. Remove spam 5. Compute awards 6. Update search index . The blue arrows are what happens when a request comes in. Say someone submits a link or vote, it goes to the cache, master database, and job queue. Then they return to the user. Then the rest happens offline, those are represented by the pink arrows. Services like Spam, Precomputer, and Thumnailer read from the queue, do the work, and update database as required. Key piece of technology is RabbitMQ. Amazing article! Definitely gives some very new ways of thinking about performance. "But they do it live in the background so it doesn’t slow down the user experience"
"But they do it live"
For those inclined to do the math, 270 million page views per month is 100 page views per second. There is absolutely no situation under which that should require 20 database servers. Be careful about whose advice you take. Very few sites on the internet go down as often or perform as badly as does Reddit. I always had a feeling that these guys were doing something clever in the background. Thank you for telling me more about my favorite social bookmarking site! May 18, 2010 | Explode My Brain! We also had a lot pains in designing schema and later updating them as Reddit did. But I have to agree with Simon, Reddit's solution won't work for many other cases. I agree with Mr Haugeland in that having to have 20 database servers to handle the load seems excessive. From reading the review it appears to me the source author has failed to recognize the real lessions. Designs like this are usually the result of the development team not understanding how to design and code for the underlying database to begin with. And perhaps the choice of the wrong underlying database based on expected usage and load. this is out of date. reddit migrated to Cassandra. Wow! this is a good work! In other words, what not to do to run a scalable website. Reddit is not opening yet again as I'm typing this. I'm a Reddit fan and I wish it would change its infrastructure to be more available. MySQL (especially MyISAM) gave RDBMSes a bad name. I have an app backed by Postgres organized in a "star schema", with one main Event table to which we do an average 200 INSERTs per second, more like 400-ish at peak, with 24 columns, most of which are foreign keys into dynamically-growing look-up tables, at which we do a combined dozen INSERT/SELECTs within that same second. One of those look-up tables has over 213 Million rows. Adding another column to that table is instant and introduces zero latency to the application. That's because Postgres treats columns as Meta-Data. Attempting this in MySQL would indeed be *suicide*, and simply not an option, because MySQL needs to rebuild the entire table. I'm not sure which version of Postgres you guys are using, but I find the locking claims surprising. If you're hell-bent on using MySQL, then do whatever you can to not use MyISAM, try to defer all text-based indexing and searching to something like Sphinx. And keep as many tables as possible as InnoDB. "Precompute everything" is actually the 1st rule in scaling applications. They've just taken it beyond where most take it. Great post! I love this kind of stuff. May 18, 2010 | Greg G.
So you basically hacked a simple key-value storage into MySQL? Why not use Cassandra, couchdb, tokyo tyrant, redis? Comparing load times between Digg and Reddit, I'd say that Digg is doing something right and Reddit is doing something wrong. Have you actually copy edited this article? Its full of awkward writing like you drafted it during a presentation and published without editing it. Lesson 4 is almost incomprehensible. Dak, I agree Lesson 4 isn't very good. What I'm trying to do is summarize what the speaker is saying in a way that is shorter and more directly applicable. Sometimes I can't figure out how to do this so I just leave my schematic version in. There are a few one liners in where I didn't feel it was worth it to expound on a point, but I left a bit in so you could decide to go to the video if you were really interested. Oh look, yet another web startup that doesn't have actual customers so they don't have to worry about data integrity, and apparently can't afford to hire someone who knows how databases work, decides that proper RDBMS design doesn't work for their problem that is very obviously not suited to the relational model in the first place. Now they have 40 servers doing the work of 2, and we're supposed to be impressed? Hiring a DBA is a lot cheaper than reinventing persistent storage, guys. chris h: The no-locking option in Postgres is available only if you are indeed adding a column. What happens if you want to change the datatype of the column, or move the column to a different table ? ChronicDB claims to apply live schema changes for Postgres. @WayneB - digg didn't do it right either. they have 200 servers, and now handle less traffic than reddit. @John Haugeland: I completely agree with you. This is an article about how a development team found a workaround to their inexperience. This is a very helpful article. Thanks for sharing all these great tips. Hopefully they help me as much as they did you! Reddit is so ridiculously slow... I guess they have some new challenges and lessons to learn, because it seems unusable most of the time.